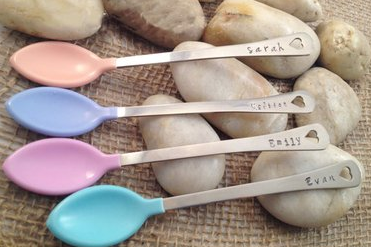 Handstamped Baby Spoons Only $9.99 + FREE Shipping! You are here: Home / Great Deals / Handstamped Baby Spoons Only $9.99 + FREE Shipping! How precious are these!? And what a HOT deal! You can currently snag these Handstamped Baby Spoons for only $9.99 + FREE Shipping (down from $13+)! These would even make fabulous baby shower gifts! You have the choice of 4 colors: pink, purple, blue, or green. You also have the choice of 4 fonts: Evan, Sarah, Madison, or Emily (as seen in the photos here). If no font choice is given, one will be chosen by the stamper.